First, don’t forget the giveaway! The Intensity Academy Saucy Pack giveaway is still open! Originally it was going to run one week, but since the sponsor and I were both a bit sidetracked by the hurricane, we’re extending it through September 20. Check out this post for the many ways to enter! We’re fine. We, our house, and possessions are unharmed; we didn’t even lose power. Our trees got a bit of a trimming, but we have a concrete-tile roof which held up quite well (which was my biggest worry). We didn’t get as much rain as I expected, so there’s no flooding, even just in the street. The neighborhood in general seems to have taken some damage to fences, but not much else. We were very, very fortunate. I’m keeping a close eye on Hurricane Jose, which is not currently predicted to touch Florida, but which is also a couple of weeks away. We’d like to buy more plywood and items to properly board up the windows to our house, but it’s likely that supplies will continue to be scarce for a bit–in part because people panic after the first hurricane of the season, but also because a lot of supplies will get diverted to Houston and the Florida Keys (obviously they need it more). Now, let’s talk cookies. 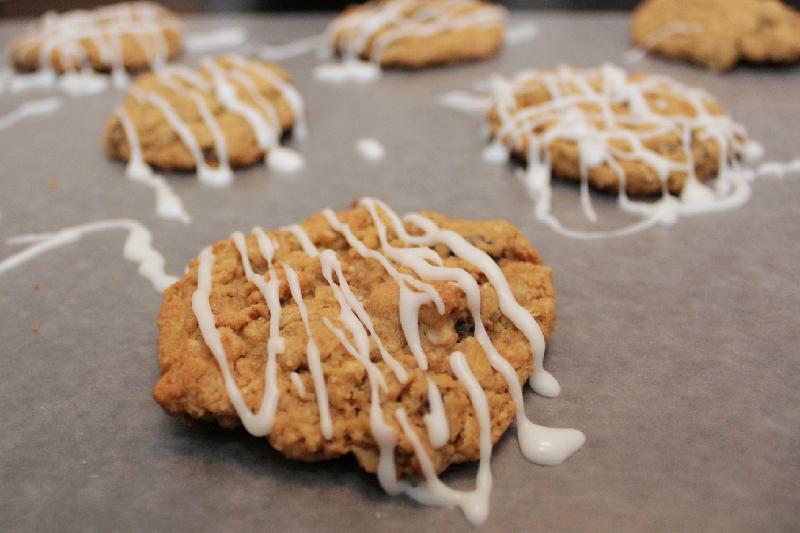 I’ve tested this Spiced Oatmeal Raisin Cookies recipe several times, and I think this is the winning one: I’ve had at least two people who “don’t like oatmeal raisin cookies” enjoy these. Conversion, complete. There are a couple of ways to make these exactly the way you want them. First, you’ll note that the cardamom is optional. I have a friend who loves cardamom, so I know she absolutely use it. I found it a little overwhelming, so if I’m making them for me or for a party, I leave the cardamom out. Second, I used a straightforward vanilla icing on this (after testing a cream cheese icing and a white chocolate one). All of them were good, but my taste testers really liked the vanilla on top of the spiced cookies. Third, the original recipe called for dark brown sugar, which I don’t have. I have light brown sugar (which is the more common type) and I turn it into dark brown sugar by adding molasses using this helpful link. I’ve listed the amounts for both methods. Note that this makes a huge batch of cookies! I use a tablespoon measure to eyeball 2-tablespoon balls of dough, which nets me about 48 modestly sized cookies. It’s fabulous for parties and the fast-approaching cookie swap season. Hot coffee. 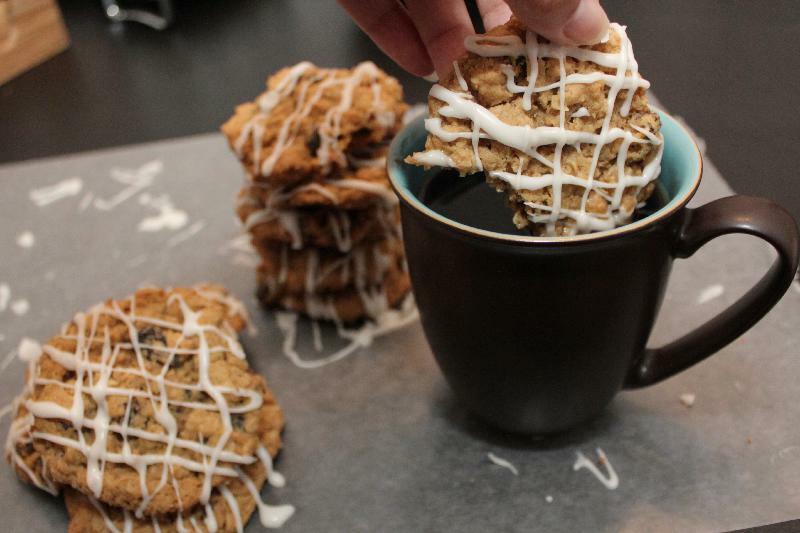 Rather, dunk the cookies in your hot coffee. You can thank me later. For a sophisticated dessert round, spike the coffee. Kahlua, Irish cream, and whiskey are all excellent choices. Cookies adapted from this recipe, icing adapted from here. Whisk or sift together dry ingredients, flour through cardamom (if using); set aside. In a separate bowl, cream together butter and sugars until mixture is fluffy and the color lightens. 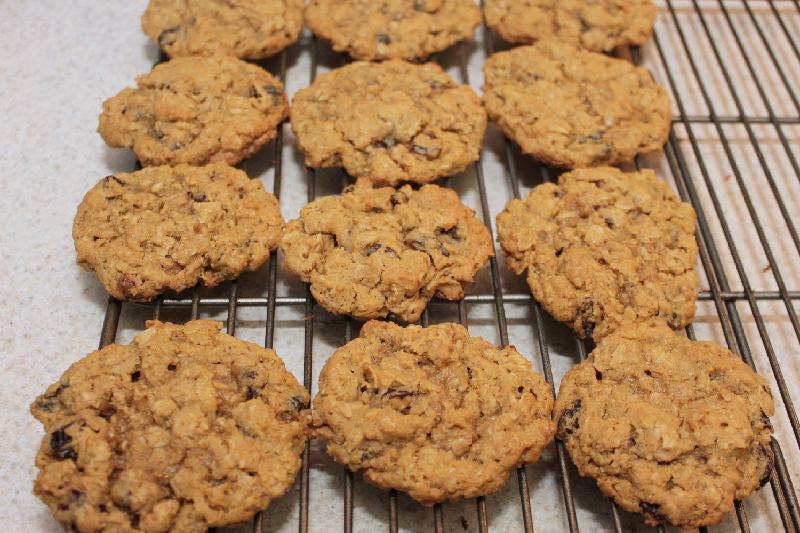 Mix together wet and dry ingredients with oats and raisins, just until no flour is visible. 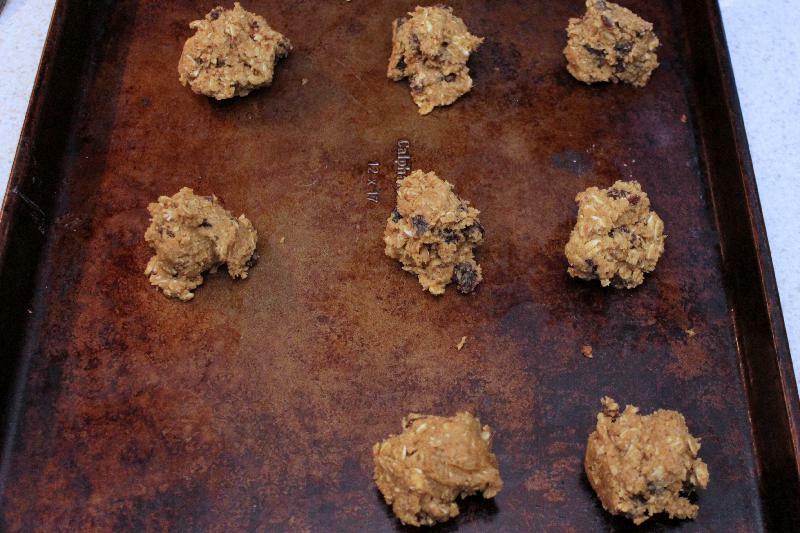 Drop in 2-tablespoon balls onto cookie sheets. Bake 10-13 minutes, or until tops are golden but the cracks are still moist. Allow to cool for 2 minutes on cookie sheet before moving to wire rack. Whisk all icing ingredients together. Use a piping bag or zipper storage bag with a corner cut off to drizzle over the cookies.